Loyalty or Liberty, Scottish Writers and the Problem of Power, a Lecture by Neal Ascherson - An event organised by the Neil Gunn Trust to be held on 15th September at Eden Court in Inverness. - Details can be found on the Neil Gunn Trust pages - see link in menu below. Light in the North, A celebration of the Life and Work of Neil M. Gunn An event organised by the Dunbeath Heritage Trust to be held on 8th November at Salmon Bothy, Dunbeath Harbour and featuring writer George Gunn and Jennifer Ross on clarsach. The Wholeness of Life, Neil Gunn, Culture and Independence a Lecture by James Robertson - An event organised by the Neil Gunn Trust to be held on 11th September at Eden Court in Inverness. - Details can be found on the Neil Gunn Trust. pages - see link in menu below. Edinburgh International Book Festival. Dairmid Gunn participated in a discussion on the topic of the friendship between Neil M Gunn and Maurice Walsh on the occasion of the 50th anniversary of Walsh's death. The event was attended by the ministers of culture of Scotland and Ireland. The Association for Scottish Literary Studies has published Neil M. Gunn's The Silver Darlings by John Burns in their ScotNotes series. NAIRN musician Mike Vass is paying tribute to one of the Highlands' best known authors with a new commission in collaboration with Calmac Ferries and House of Lochar Publishing. See Creative Scotland announces Traditional Arts Commissions for details of the comission. Inaugural Issue of the Neil Gunn Circle will be launched at the Light in the North festival in Dunbeath, 8th November 2013. See Whittles Publishing Neil Gunn Circle for details of the Journal. 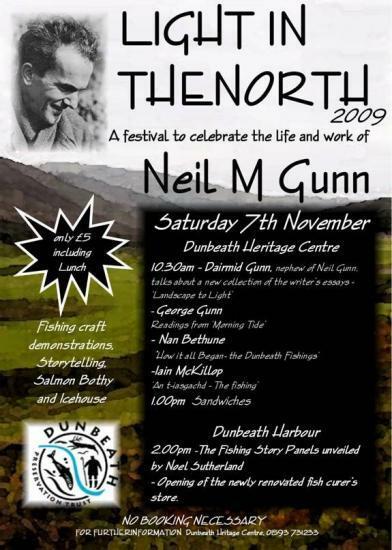 Light in the North - a festival organised by the Dunbeath Preservation Trust to celebrate the life and work of Neil Gunn. A talk at the Dunbeath Heritage Centre by Scottish Education Secretary Michael Russell entitled ' A writer in a time of change. Gunn, Walsh and the process of independence'. Television production (Alba TV) by Caledonian TV Productions on The Silver Darlings. Belonging to this Place a Lecture by Mark Stephen - An event organised by the Neil Gunn Trust to be held on 27th July at Eden Court in Inverness. - Details can be found on the Neil Gunn Trust. pages - see link in menu below. Three short stories from Half-Light broadcast on BBC Radio 4 on the 18th and 25th May and 1st June. 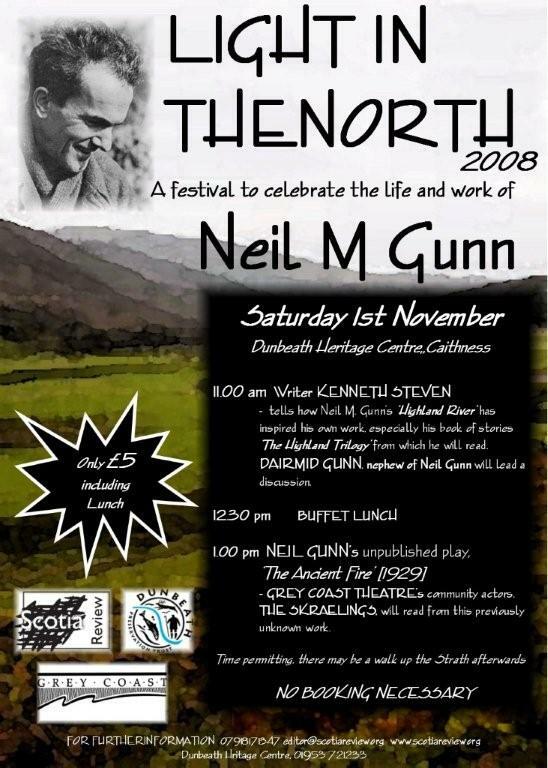 Light in the North - a festival to celebrate the life and work of Neil M Gunn. Launch and presentation by Dairmid Gunn of recently published collection of short stories Half-Light. by Neil M Gunn and a paper, The Other Grey Coast, given by poet and dramatist George Gunn. Half-Light - Whittles Publishing have announced a new collection of stories by Neil Gunn for publication in November/December. Details are at: Half-Light. Belief in Ourselves - Whittles Publishing have published a new collection of essays by Neil Gunn. Details are at: Belief in Ourselves. Landward TV programme - 3 minutes coverage of Neil Gunn's birthplace, Dunbeath. Neil Gunn Writing Competition 2010 - Details can be found on the Neil Gunn Trust pages - see link in menu below. A Beacon of Hope - Event organised by the Neil Gunn Trust held on 1st June at Eden Court in Inverness. - Details can be found on the Neil Gunn Trust. pages - see link in menu below. Highland Publishing Showcase 2009 - At the Highland Publishing Showcase evening at the Eden Court Theatre in Inverness on the 22nd October Dairmid Gunn gave a short presentation on Landscape to Light, a recently published collection of essays by Neil M Gunn. Neil Gunn Lecture 2009 - Owen Dudley Edwards gave a talk entitled Burns, Gunn and the Scottish Wider World on Wednesday 7th October at the Eden Court Theatre, Inverness. See the Neil Gunn Trust web pages on this site for further details. Visit of Prince Charles to the Dunbeath Heritage Centre - On 4th August Prince Charles toured the Dunbeath heritage Centre and discussed Neil Gunn and his works. Neil Gunn Lecture 2009 - Owen Dudley Edwards will give the Neil Gunn Lecture at the Eden Court in Inverness on Wednesday 7th October 2009. Further details are on the NMG Trust pages - see link in menu below. Neil Gunn Writing Competition 2009 - Details of the results and comment can be found on the Neil Gunn Trust. pages - see link in menu below. New Plaque Unveiled - A new plaque has been unveiled by Inverness City Heritage Trust in conjunction with the Neil Gunn Trust, on the former Customs House, now Optical Express, in Inverness High street. see The Inverness Courier for the full story. Neil Gunn Circle - A new annual journal devoted to Neil Gunn has been proposed. Details will appear at: Neil Gunn Circle. Landscape to Light - Whittles Publishing have announced a new collection of essays by Neil Gunn for publication in July. Details are at: Landscape to Light. 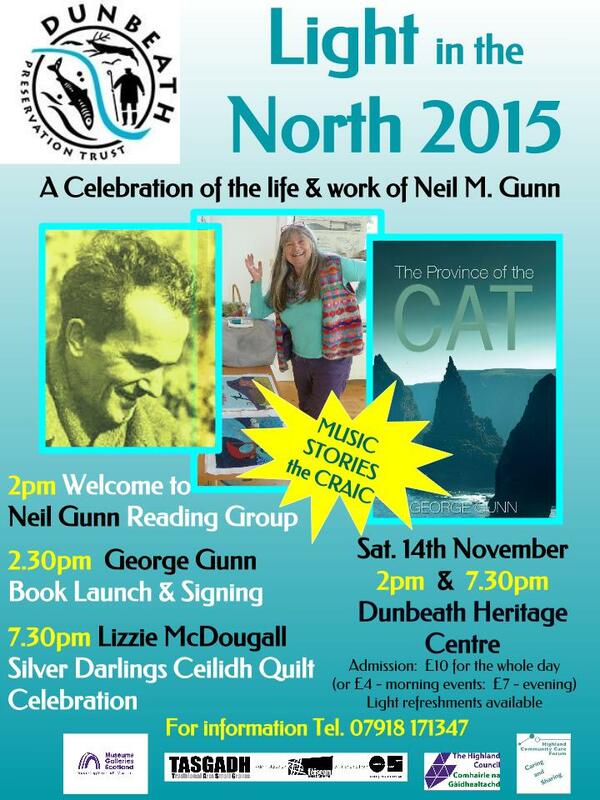 Light in the North - A Festival to Celebrate the Life and Work of Neil M Gunn - 1st November, Dunbeath Heritage Centre. Festival Poster. Neil Gunn Writing Competition 2009 - The biennial Neil Gunn Writing Competition is organised by The Highland Council and the Neil Gunn Trust. Full details can be found at the Highland Council Neil Gunn web pages. Neil Gunn Lecture - Lesley Riddoch will give the Neil Gunn Lecture, during the Inverness Book Festival, at the Eden Court on Friday 3rd October 2008. Further details are on the NMG Trust pages - see link in menu below. Light in the North - celebrations to mark Neil Gunn's birthday (8th November) will take place on 8th, 9th and 10th November in Dunbeath under the auspices of the Dunbeath Preservation Trust. Full details are here. 31st October - Neil Gunn View Point re-opened by writer Margaret Elphinstone. 2nd October - Prize-giving in Strathpeffer for 2007 Neil Gunn Writing Competition. Neil Gunn lecture at Inverness Book Festival given by 'geopoet' Kenneth White. Biographer John Pick delivers the McNeillie lecture (on Neil M Gunn) at the Scottish Book Town Festival in Wigtown. Dairmid Gunn in discussion with film director Murray Grigor at Neil Gunn Event at the Edinburgh International Book Festival. The 1948 film of The Silver Darlings directed by Karl Grüne and starring Helen Shingler is available on DVD. The Poaching at Grianan is published in a limited edition by Merchiston Publishing. Alistair Reid: The Neil Gunn Lecture at the Edinburgh International Book Festival Saturday 28th August at 3.30pm. Whittles Publishing republished Second Sight and Wild Geese Overhead.. The new Dunbeath Heritage Centre WWW site provides information on Neil Gunn's birthplace and includes an illustrated journey through Dunbeath strath. Neil Gunn World-Wide Web site given a face-lift after eight years on the Internet. The site now has the address http://www.neilgunn.org.uk/ Old links will still work for the time being but please amend links to the new address.